March Concert Sure to Shake The Winter Blues! TICKETS ARE AVAILABLE AT THE DOOR STARTING AT 7 P.M. FOR BOTH FRIDAY AND SATURDAY PERFORMANCES. 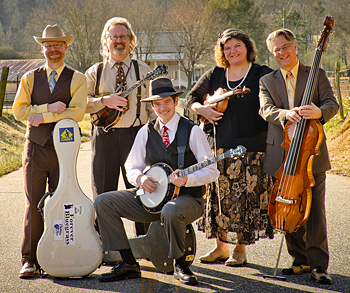 Experience the magic when country bluegrass and classical collide during Arrowhead Chorale’s March concert featuring the incredible bluegrass band Monroe Crossing! The concert will feature the Minnesota debut of Carol Barnett’s Mortals and Angels: A Bluegrass Te Deum. Mortals and Angels had its world premiere at Carnegie Hall on January 25, 2016 and is a full length piece especially crafted for a bluegrass ensemble and a classical chorus. Named in honor of Bill Monroe, “The Father of Bluegrass Music,” Monroe Crossing dazzles audiences with an electrifying blend of classic bluegrass, bluegrass gospel, and heartfelt originals—making them the perfect partner to bring to life this new work of Barnett that blends ancient scripture and contemporary prayer within a classical structure infused with traditional bluegrass music. Other pieces the Chorale will be performing include: Didn’t it Rain (Michael A. Gray); The Maid of Culmore, a capella (Joseph Gregoria); J’entendes Le Moulin (a French Canadian folksong); and Yonder Come Day (Craig Carnahan). Two evening performances will deliver grand, acoustic thrills in the Duluth Depot’s Great Hall: Friday, March 18 at 7:30 p.m. and Saturday, March 19 at 7:30 p.m. Please join us for an incredible and special evening!